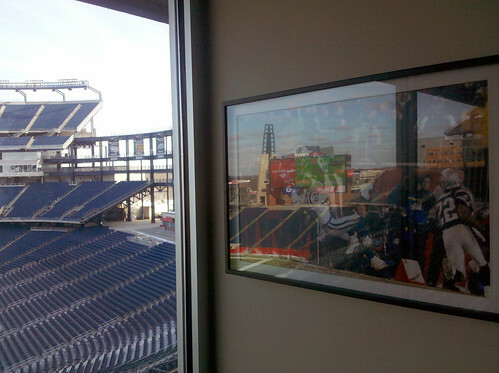 The Unkindest Cut of All - Cursed To First - Sox and Pats forever. 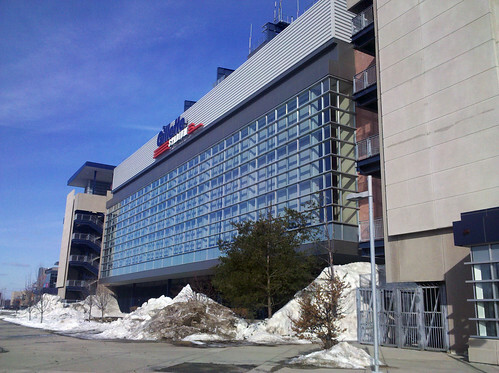 Gillette Stadium, that's where. THE SCENE OF THE CRIME. One of my friends, hearing of this on Wednesday, urged me to call in sick. Another said, simply, "too soon." But I "manned up" and went -- first of all, I am a Professional (ahem). And secondly, it was the only time I've actually seen the stadium this year, since I never got tickets to any games in the 2010-11 season. On the brighter side, I have never and will never have parking this good at this place again. Such as me is not allowed to walk into this lot on game days, as a matter of fact. 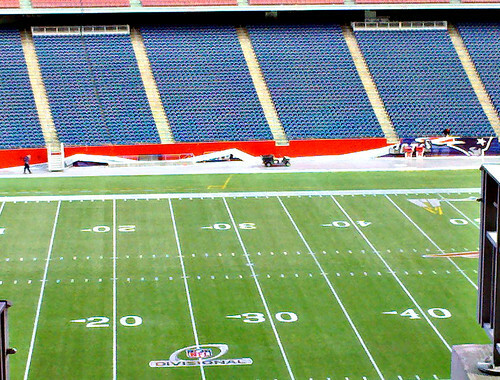 That is, until I suddenly noticed two things at once, while scanning the field for photo ops, that made me decide to stop looking out the windows: 1) workers removing the Patriots banner from the field wall, and 2) the playoff logo still painted on the field. At that moment, suddenly I couldn't help but think of the classic (and, warning to the sensitive, fairly vulgar) line that Dante yells at his obnoxious friend Randall toward the end of Clerks, the one that ends with "pouring sugar in my gas tank." I think the friend who said "too soon" hit the nail right on the head. 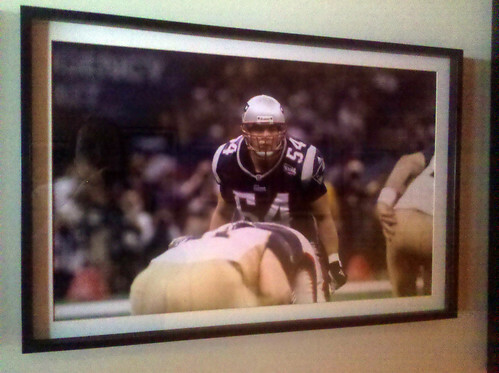 I have heard (though of course I forget where) that these photos were once in the team clubhouse to remind the players of what they'd accomplished, but then Belichick had them taken out when a new crop of young players arrived, telling them they'd have to produce their own highlights to be captured on film for posterity. 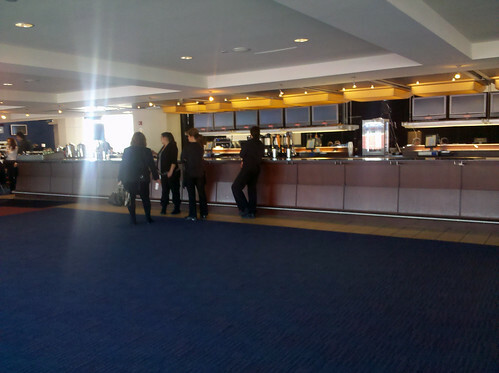 This photo also shows just one part of the immense bar in the Clubhouse. Have I made clear that it is ever so posh in there, sweeties, darlings? 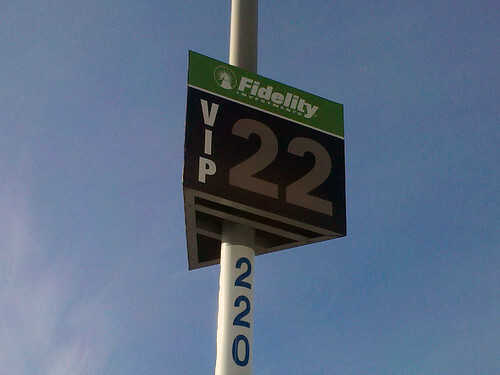 I get the sense being an attendant up here is a high-seniority job among the stadium workers. I had a pretty great conversation with a couple of these ladies about the people they've met while working there (let's just say I have been assured that Tom Brady's younger son looks exactly like him). 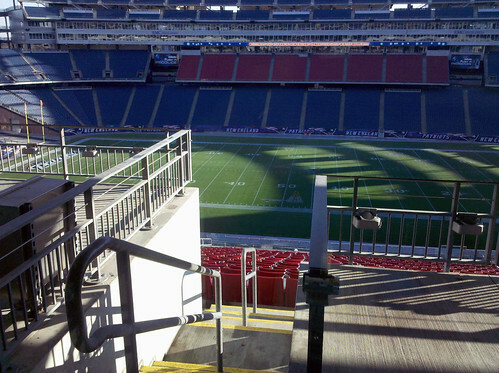 So I guess, in the end, getting to see a part of Gillette I wouldn't have otherwise was kind of a nice experience, in its own way. Even if the timing also made it more than a little ironic and bittersweet. Beth: Please... I appreciate your passion but it is just a game.. There are 32 teams in this league and Boston "will be okay" if they don't win it all this year. This was meant to be at least partially tongue in cheek, but that apparently was a failure.